This weekend I found myself in a situation I never thought I’d be in. Okay- that’s a sentence I’ve said fairly often since I started this writing lark (especially when I’m being that Kay Jaybee person). This weekend however, it is totally true. As I type this I am reflecting on two days sat in a room of stall holders within the beautiful St Pierre Marriott Hotel, nr Chepstow. Why so far from home? 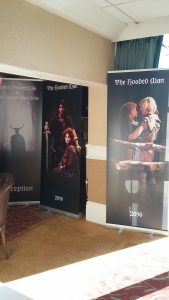 I was attending The Hooded Man event- a celebration of the immensely popular television series from the 1980’s- Robin of Sherwood. You cannot have escaped noticing if you’re a follower of this blog, that I am something of a Robin Hood fan. 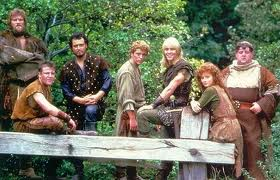 I like everything about the legend- and that love was engendered by Robin of Sherwood. I don’t claim that it saved my life or anything, but it set my imagination racing off in a direction previously unexplored- and it hasn’t stopped racing since. I never thought I’d be in a situation where I’d be able to thank some of the people that sparked that flame of interest in me a shy teenager. A spark that took me on a journey which has been both exciting and unexpected, and has taken me from archaeologist, to medieval historian, to novelist, literary festival organiser, writing tutor and, in the future, who knows what else. 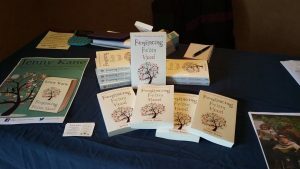 So here I am now- a day after the event- in the corner of the cafe where I write my fiction; thinking about the experience of selling my books to the conference attendees. It is incredible how many people I met that feel their lives have been as influenced by the simple act of watching a television programme. And- if I’m honest- feeling oddly emotional that I did have the chance to say thank you- and that my words were appreciated, and not merely kindly tolerated. This particular event is especially important for RoS fan’s. For the first time in 30 years, all the surviving cast members have reunited to record an audio follow up the final televised episode, which was first televised in 1986. This new episode, The Knights of the Apocalypse, stars Jason Connery as Robin, and has been produced by the lovely Barnaby Eaton-Jones. It is thanks to Barnaby that I was at the event, surrounded by those men and women who set my life on its roller coaster course. Jason Connery, Michael Praed, Judy Trott, Mark Ryan, Peter Llewellyn Williams, Clive Mantle, Jeremy Bulloch, Claire Toeman, Michael Craig, James Coombes, Rula Lenska and Marcus Gilbert were all present, and correct, and on fine form. As was the incredible force of nature that is Esta Charkham, the programmes casting director and then producer. The woman has a magic eye for casting- thank goodness! The cast are all so kind, friendly- and very funny. Mark Ryan (Nasir) has had us all in stitches many times with his- shall we say ‘puckish’ sense of humour! This was particularly the case when the cast performed a ‘cut scene’ from the audio show live on the event stage- I can’t tell you what it was about- but the humour was adult, and it was very very funny. I will not mention Mark’s disco dancing, as that would be cruel…. 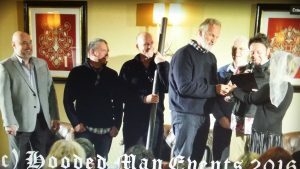 I will tell you however, that we were all treated- all be it 30 years late to witness the wedding of Little John and Meg of Wickham- thanks to vicar Barnaby! There were many interview sessions held throughout the day, and although I was unable to attend many as I was busy selling my words to unwitting passersby, those I did see were so much fun. Held together by “The last word in RoS himself”- Andrew Orton- (if you are a fan, and you haven’t purchased his two volume set The Hooded Man– then pop them on your Christmas list the very minute), the cast chats were informative and light hearted, and it was clear that every actor, whether they have gone on to be household names, or whether it was their only acting job, have as much affection for the show as those that came to see them. 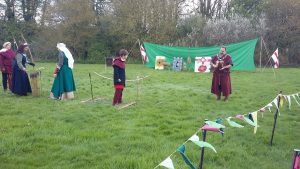 As well as having the chance to acquire autographs and photos with the stars; there was plenty of opportunity to eat way too much medieval fayre (with the odd drop of alcohol). 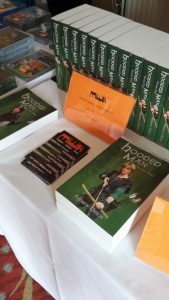 There were excellent displays of archery and sword play from Bowlore, Andrew Orton was busy selling his much respected books on the background to the series, and there was the chance to buy fabulous event t-shirts. 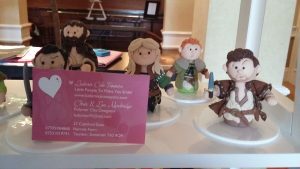 You could also buy these gorgeous little figures inspired by the show; the event had lots to offer. The days past have been truly wonderful. They have added greatly to my store of memories and- without a doubt- will form the basis for a new story. Trust me- the people watching alone could fuel a trilogy! 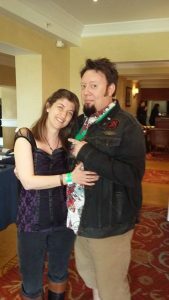 I made some lovely new friends, put faces to the names of Facebook friends, and finally caught up with the lovely Jonathan Greene, who is writing the novel version of The Knights of the Apocalypse. Actually- he was sat next to me writing it for most of Sunday- it was soooo hard not too peep! A final thank you to Barnaby and his delicious wife, Kim. 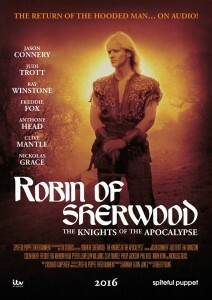 When Richard ‘Kip’ Carpenter first penned the catchphrase, ‘Nothing’s Forgotten’ for Robin of Sherwood over thirty years ago, I wonder if he had any idea how pertinent those words would become. Nothings Forgotten. Nothing is ever forgotten. I had a chance to meet Mark, Clive and Kip in Chicago in the USA. Greatest time and loveliest, most fun people ever. RoS is and will be a great series. Wish I was in the UK! A lovely post and a true reflection of the weekend. I also look forward to reading your book someday. Yes, a very unique and memorable experience. One of the best weekends of my life! Wish I had known about it! Sounds like it was a lot of fun! I’ll have to save the dates for 2018! !